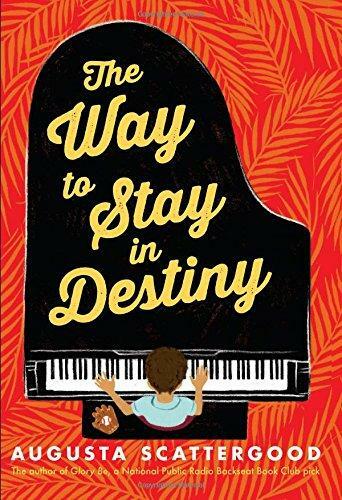 THE WAY TO STAY IN DESTINY, my second middle-grade novel, was recently published by Scholastic Press. It’s the story of a boy named Theo who’s forced to move to a little town called Destiny, Florida, with an uncle he doesn’t really know. Theo’s a resourceful, talented boy. His uncle’s an unhappy Vietnam veteran who doesn’t know how to raise a kid. But there’s a bright ray of sunshine in their new life together— Miss Sister Grandersole, dancer, advisor, and owner of the Rest Easy Rooming House and Dance Studio, where they fortunately have landed. We had recently moved to Florida and I was feeling a little like Theo! Where am I? Why are all these lizards in my garden? Also, as a child, I had some remarkable dance and piano teachers. Not always remarkable in their ability to teach—though some were extremely talented!—but certainly interesting characters. Once I convinced my critique group and my early readers that “Sister” was not a retired nun wearing red tap shoes, Miss Sister Grandersole was the most fun character to write. I guess you could say I was inspired by memories and moving. My new book doesn’t focus on one truly important historical event like Freedom Summer, the backbone for my first novel, GLORY BE. The aftermath of the Vietnam conflict plays into the story, and there were details from that time that I wanted to get right. I used veterans’ sites to read of others’ experiences coming back from Vietnam. And I consulted my friends who had served. I also verified all the baseball facts, but that part was easy. I loved reading about Hank Aaron’s journey. Because of his career milestones, THE WAY TO STAY IN DESTINY is set in 1974. Sometimes that seemed so recent, I had trouble remembering that made it historical fiction! The hardest part of writing for me is that first draft. I struggle. A lot. But I love the revision process. Generally, I try to break it down and not tackle too many things at once. I’ll revise first for plot and character arcs. Then I’ll get to the fun part, making the language and the dialog read in a way I hope enriches the story. I could go on and on, but I don’t want to make new writers think it’s not fun to write a book. Even on the days that nothing seems to work, writing really is more than hard, gut-wrenching work. It’s often a joy. Make the story sing and make the plot move quickly! Of course, these are challenges all writing presents, no matter the genre. When creating historical fiction, it’s tempting to dump all the important facts into readers’ laps. But the smallest details like skate keys and 45s (those are musical recordings, for those of you too young to remember!) and anti-war buttons on knapsacks really bring the time period alive. Quite truthfully, the story behind THE WAY TO STAY IN DESTINY is timeless. A boy finds himself an outsider in a totally new place, meets someone who’s been there forever, makes a friend. Theo’s a kid who’s resilient, in the worst of situations. The post-Vietnam time period, the uncle who can’t quite get past his wartime experiences, families that were split apart by strong feelings during the Vietnam conflict should offer teachers an opportunity to discuss so many things. Perhaps even a few things not too often found in middle-grade novels. But at heart, THE WAY TO STAY IN DESTINY is really about discovering family, not only the family you are born into, but the family of your heart. Those are the people who come into your life when you most need them. Thank you, Caroline, for sharing DESTINY with your readers! Very happy to share. Let’s do this again in a few years!